Heat oven to 350°F. If using crescent rolls: Separate dough into 4 rectangles. If using dough sheet: Cut sheet into 4 rectangles. Coat both sides of each rectangle with cornmeal. Place in ungreased 13x9-inch pan; press over bottom and 1/2 inch up sides to form crust. Press edges and perforations to seal. Sprinkle with any remaining cornmeal. 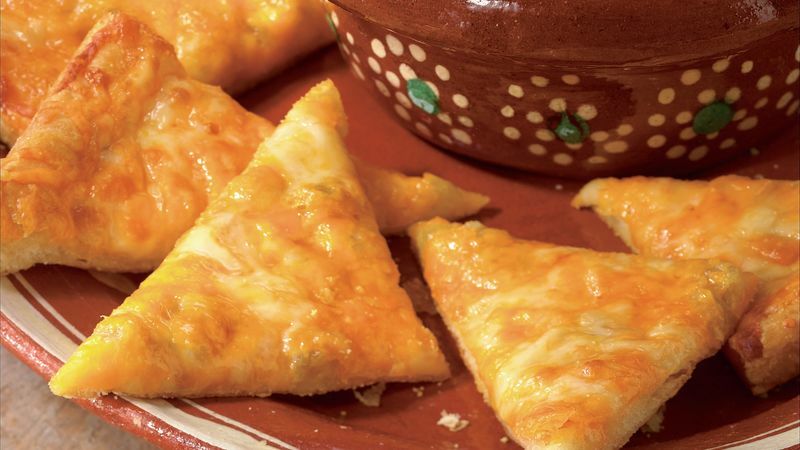 Top evenly with chiles, Cheddar and mozzarella cheese. Bake at 350°F. for 24 to 28 minutes or until crust is golden brown. Cool 5 minutes. Cut into triangles or squares. Serve warm with salsa. Like it spicy? Prepare these nachos with shredded hot-pepper cheese. Chopped green onions are a colorful, crunchy topping for the salsa. These crisp nachos go great with bowls of hot chili at lunch or supper. Red and green grapes are a refreshing finish.